In this news broadcast, it is reported that London Bookstore owner Marc Emery (who, in 1984, would co-found Freedom Party of Ontario) who has announced that he will not pay a new Business Improvement Area (BIA) tax, could face court action if he does not pay. 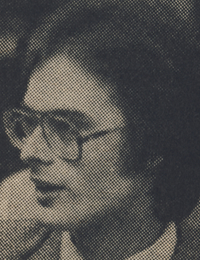 Marc Emery describes who was motivated to ask for the tax and why; and he describes the fact that those business owners who did not respond to a questionnaire about imposing the tax were deemed to be in favour of the tax, such that the city then created the bylaw for the small handful of business persons who wanted the money to do with it as their association wanted to do with it. Mayor Al Gleeson is heard stating that the tax is a legal by-law and that the city will seek enforcement through the courts against a person who does not pay it. It is reported that Emery is circulating a petition among other store owners in the area.